There is a reason that both Joe Paterno, former head coach of the Penn State Nittany Lion football team, and Graham Spanier, former President of Penn State University, were fired in the wake of the current scandal: they failed in their roles as leaders. Whatever the details end up being, the events took place on their watch and ultimately, they are responsible. 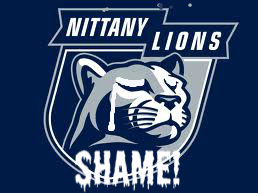 I think the Board took the necessary decisive action with regard to Spanier and Paterno--but it remains to be seen who else should be held accountable. This is a poignant lesson for leaders at all levels of organizations. Organizational culture is most often a reflection of leadership. If leaders overlook minor things, soon there will be more "minor" things happening within the organization. In time, minor things will develop into less-than-minor things. Before long, there is a grown man showering naked "horsing around" with young boys at the University YOU are responsible for. Jerry Sandusky didn't develop overnight. I am of the opinion that the only way this could happen at PSU is because there was a culture that allowed for leaders to "overlook" things that should have been major warning signs within a healthy organization. PSU had a cancer and only now has the tumor become visible to the world. Perhaps with new leadership, PSU can start the long road to recovery.